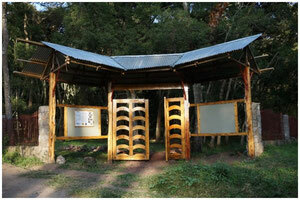 Established in 1978, the Wondo Genet College Arboretum covers an area of 4 ha. There are about 300 plots of 10 m x 10 m for research and conservation purposes. On each plot at a spacing of 2 m between trees 25 trees have been planted. Overall nowadays there are about 95 different tree and shrub species represented in the arboretum, predominantly consisting of exotic species. 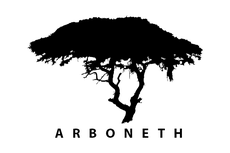 There has been continuous planting from 1979 until 1990 as well as a replanting and an additional expansion in the year 2000 and during the ARBOPRO-project. Students, using the Arboretum for learning. In the back, the Arboretum Information Centre. 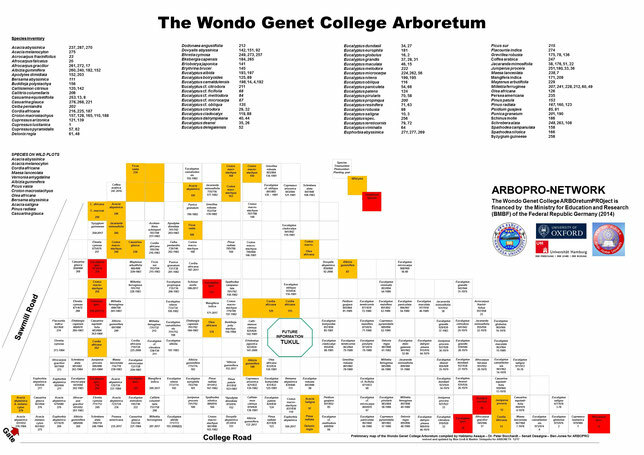 During the ARBOPRO-project a map of the Wondo Genet Collage Arboretum was created. Max Groß from Hamburg University started an Inventory of the arboretum with this map but recognized that this map is in need of improvement. He used the old map as a foundation and updated it. The potential of the Arboretum is high, but the Arboretum is not used like an Arboretum of an University of Forestry should use it. Just half of the plots are planted with trees. For use, for getting visitors, for education and research. The new information center remains nearly unused (09/2018 - update: just recently it got basically furnished and electric power supply). During my last days (01/2018) of staying in Wondo Genet, Dr. Amare and me tried to get scrapped tables, chairs and poster walls to have even something inside you can use, but it didn’t work out. Too bad, a permission wasn’t accepted. 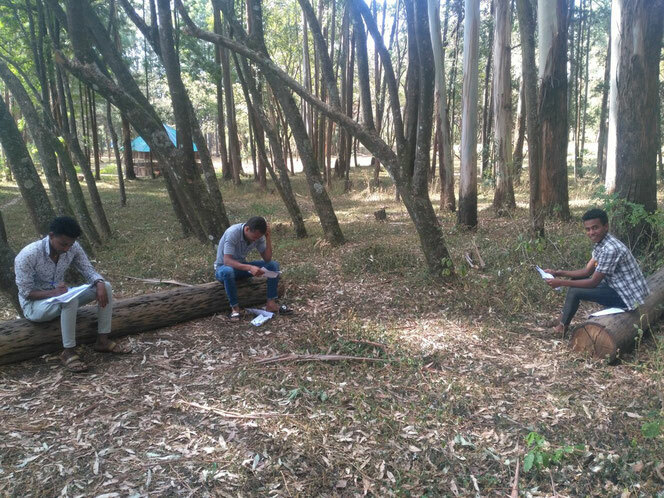 For the students it will be a great advance to have a proper Arboretum at Wondo Genet College. - buying new tools and equipment for the arboretum workers to keep it clean.